That is not bad given that the facility only broke ground in October 2006 and did not roll out any completed vehicles until over three years later in February of 2010. To reach 1 million cars in 3.5 years requires steady production of nearly 300,000 vehicles per year. The plant was the result of an initial investment of $1 billion by Kia, who began fabrication of the Sorrento at KMMG on November 16, 2009, resulting in the creation of more than 11,000 jobs, with on-site and local suppliers, in the region. After a $100 million expansion was completed early last year, yearly production capacity was raised to 360,000 vehicles. The Optima mid-size sedan, added in 2011, has become the brand's best-selling vehicle in the US for 19 consecutive months. "Building one million vehicles in less than four years is a tremendous achievement and one that each one of our more than 3,000 team members can take great pride in," said Byung Mo Ahn, Group President and CEO for Kia Motors America and Kia Motors Manufacturing Georgia. "People are the heart and soul of this company, and our team members' commitment to world class quality is one of the major driving forces behind Kia's unprecedented sales and market share growth in the U.S. over the last few years." Established in 1944, Kia originally built bicycles and then motorcycles, not moving into automotive production until 1973. Owned in part by Hyundai, the combined firms comprise the fourth largest auto group in the world, but their US market share has increased annually for 15 years straight. 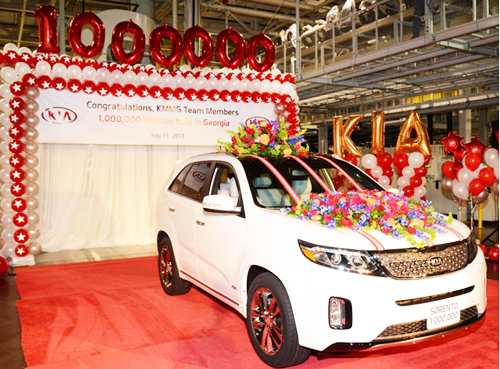 The one millionth Sorento will be allocated to one of Kia Motors America's more than 765 dealerships nationwide. We wonder if someone gets a prize for buying the one millionth Kia built in the US? A twofer would be nice, don’t you think?